Insert the nozzle inside the heater block. 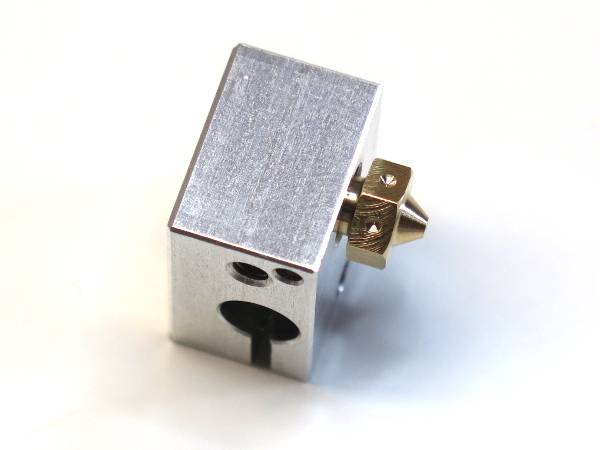 With the hex shaped head the closest possible of the heater block. Tighten very slightly the nozzle against the heater block. Then un-screw it by 1/4 up to 1/2 of a turn. 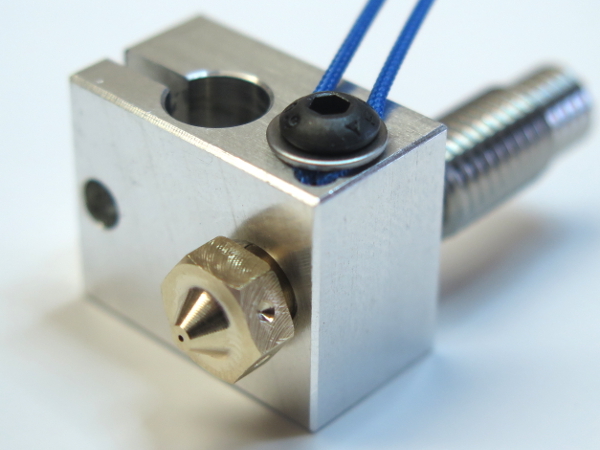 Now screw the heat break in the same opposite hole as the nozzle. You must screw it until it’s deep inside. Take 2 keys of the proper size and slightly tight them up. WARNING: Just tighten the whole thing very slightly, because the aluminum thread inside the heater block is very fragile. 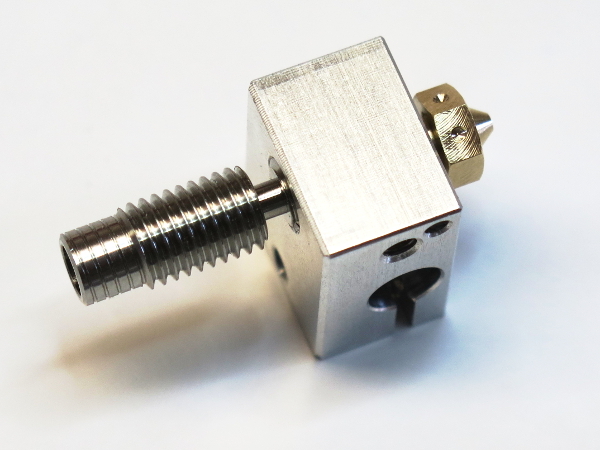 You will need to tighten again anyway once the hot end is hot later on. Take the blue fiber glass tube. Cut 2 parts of about 35mm long. 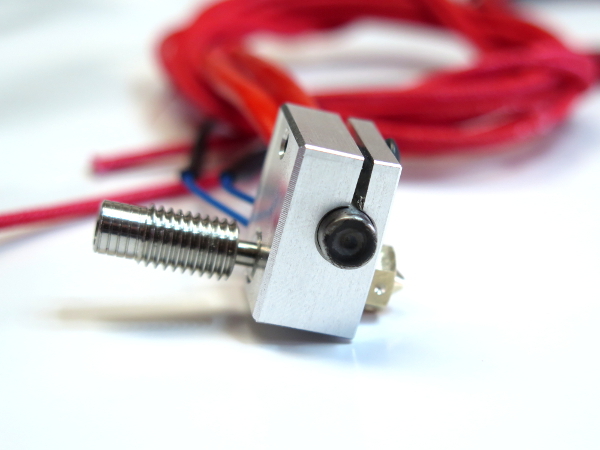 Insert the thermistor lead wires inside . 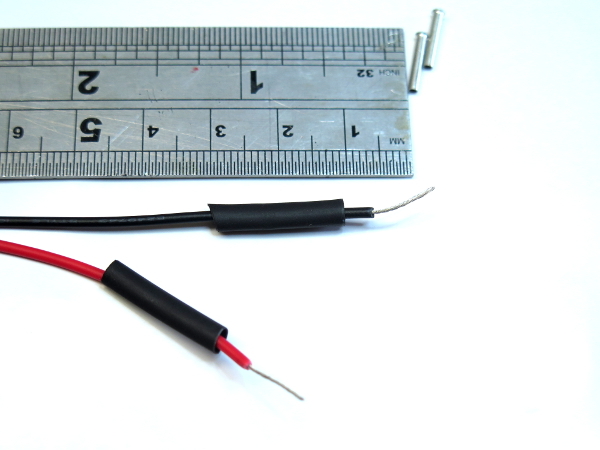 Warning: The thermistor wires are extremely sensitive and fragile, so be very careful with them! 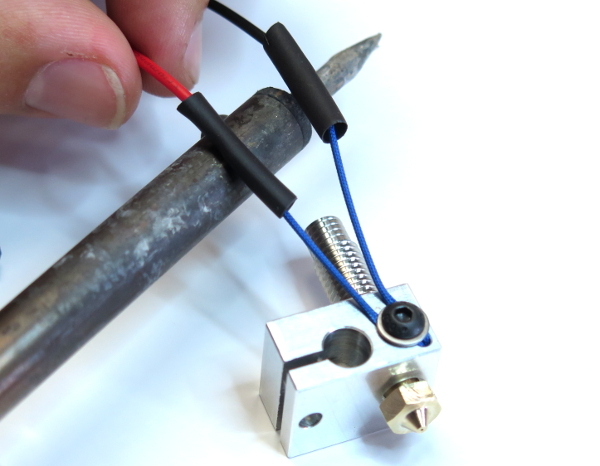 take the thermistor between your fingers and make a 90° angle on a 5mm length from the thermistor head. 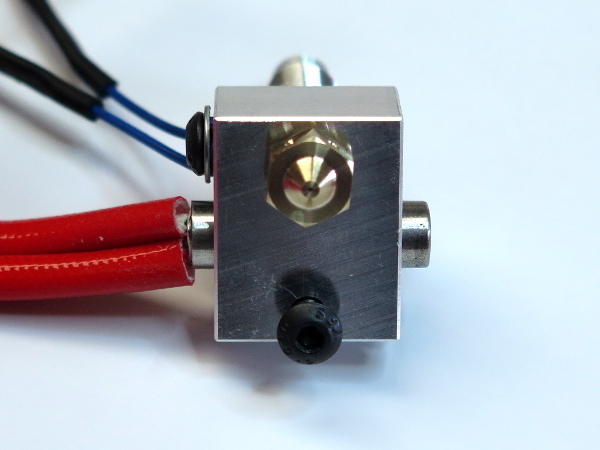 Place the thermistor inside the small dedicated hole on the corner of the heater block near the nozzle. 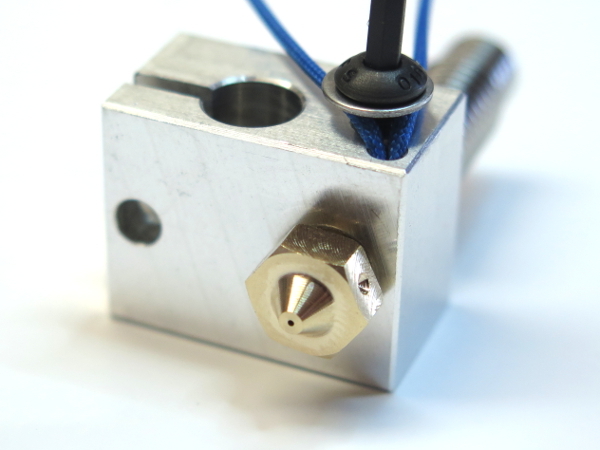 Prepare the M3x4mmscrew and it’s washer, start to screw it inside the threaded hole next to the thermistor. 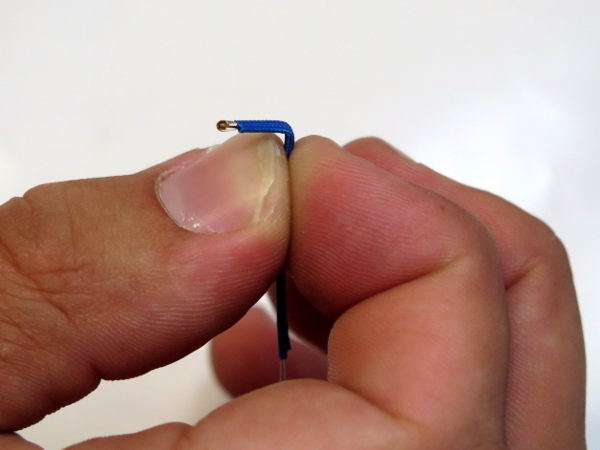 Make it so the thermistor wires are going on both sides of the screw as shown on the picture. Note: Check that the fiber glass insulator is still insulating the very end of the thermistor so that the legs of the thermistor have no contact between them. 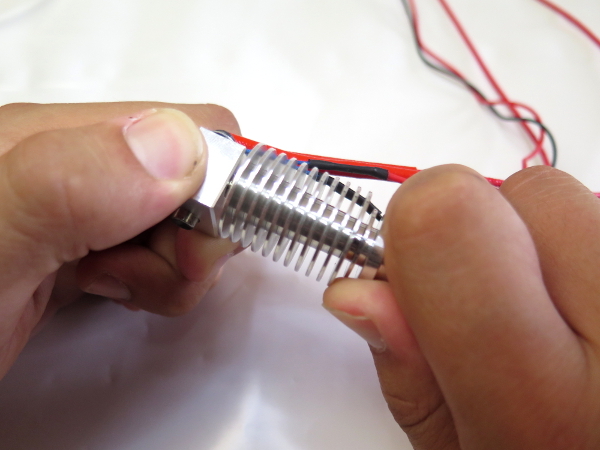 Tighten the screw in order to clamp the fiber glass insulator and hold the thermistor in place. Here is a view of the assembly once done. Check that the blue insulator is still properly insulating the thermistor wires neat the thermistor head. If the wires are have contact on the heater block you will get some bad or wrong temperature readings leading to some failures later on. 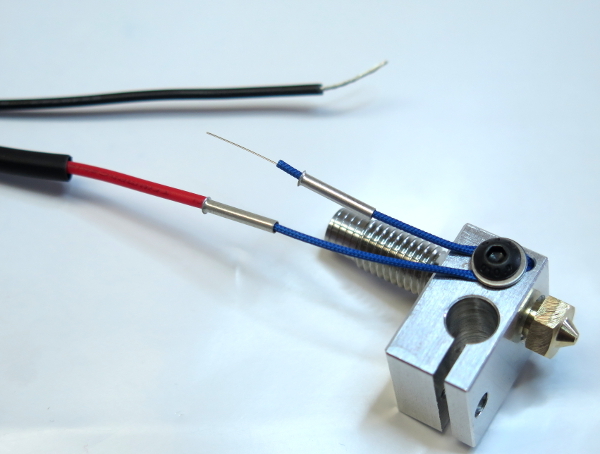 Insert the heater cartridge so that the power cables are on the same side as the thermistor lead wires. Center the heater cartridge on the heater block. 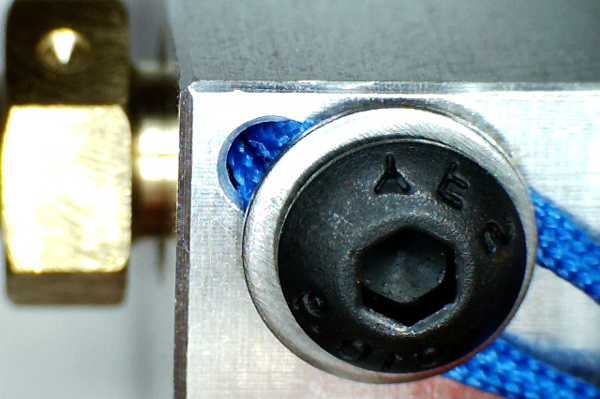 Insert a M3X10 screw inside the hole in order to clamp the heater cartridge inside the hater block. Screw it until the heater block is slightly deformed in order to make sure the heater cartridge won’t get out of the heater block. Strip the end of the black and red wires and insert 2 pieces of heat shrink tubing over them. 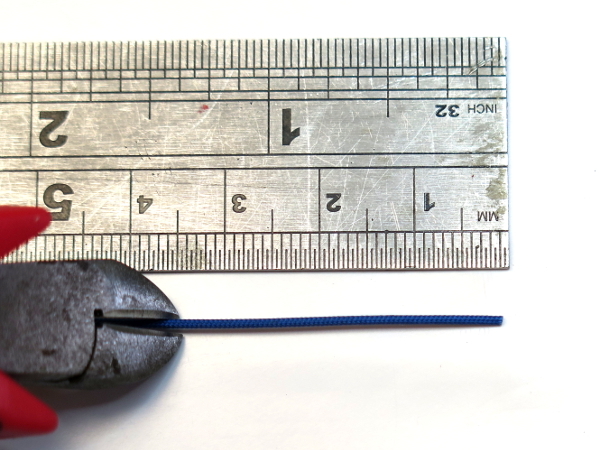 Place the Ferules on each thermistor blue insulator. 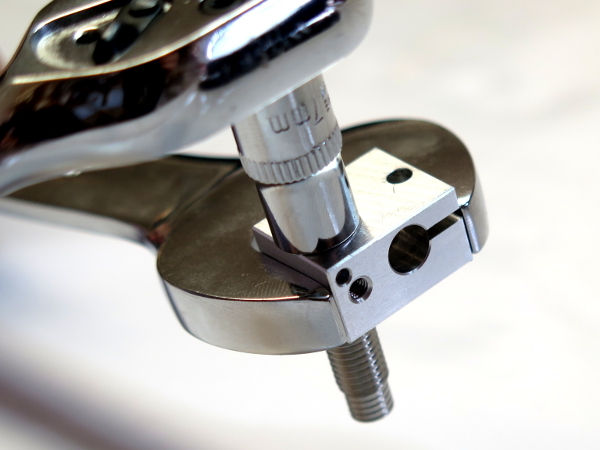 If you place the larger part of the ferule has shown on the picture it will help you for the next steps. 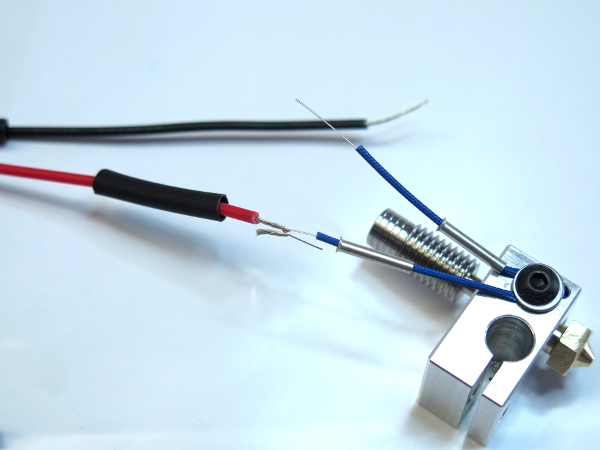 Inter-cross the lead wires of the thermistor with the one of the Red and black wires in order to make an electrical contact between them. Now slide the ferule over the contact. 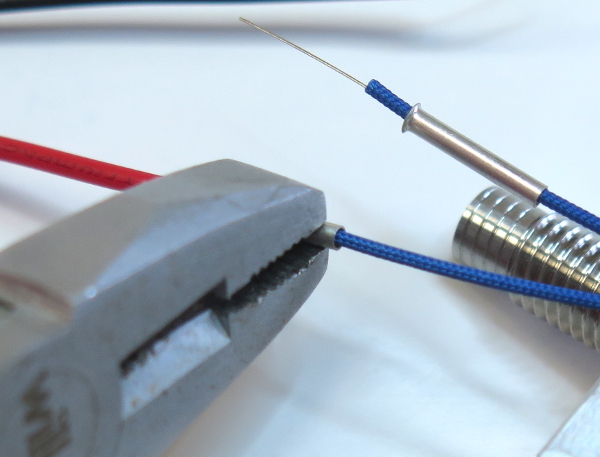 With a flat pliers, just smash the ferule in order to seal the contact between the 2 wires. 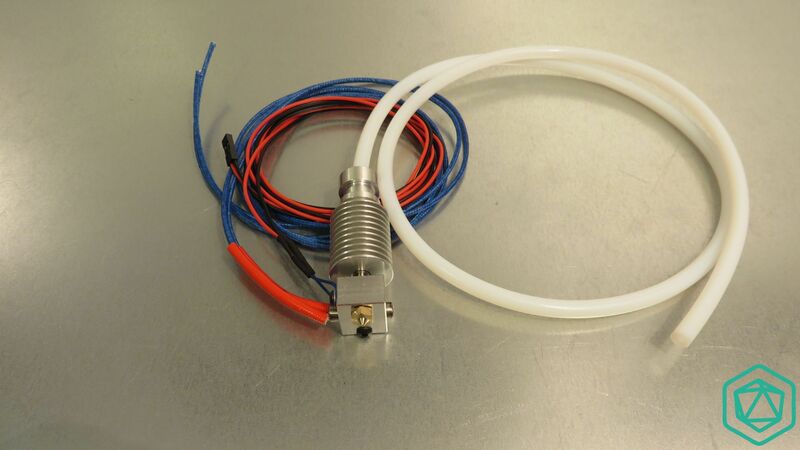 Do the same for the second thermistor wire. Now bring the heat shrink tubing back over the smashed ferules. 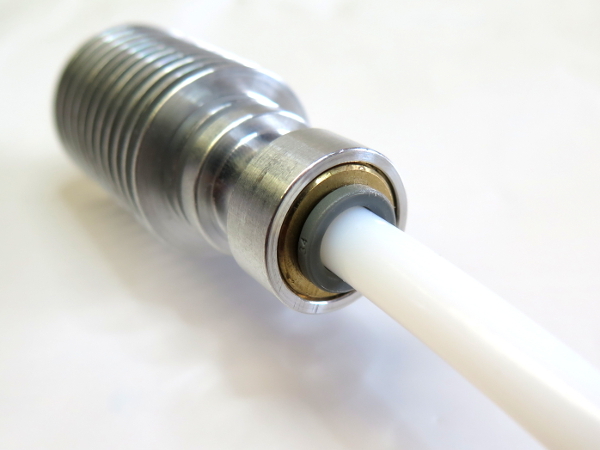 You can use a lighter or a candler or a solder iron in order to shrink the tubing. This last step is to electrically insulate the ferule between them. Tighten it only slightly with your hands, it’s enough. Take the PTFE tubing and slide it inside the heat sink hole as mush as possible. Cette entrée a été publiée dans Imprimante Scalar X10, Imprimantes, Têtes d'impression le 16 May 2015 par 3D Modular Systems.